Despite the hot weather, there are times when I crave for a good pot of steamboat. And quite often do I find myself going for cheap steamboat buffets around Sunway. Fortunately, I was able to try out the new steamboat restaurant by Absolute Thai themselves. Note: Absolute Thai Hot Pot is owned by the same person who owns Absolute Thai, Absolute Thai Gardens, Amarin Heavenly Thai, Basil, Celadon, Busaba and Thai Thai Restaurant. However, they do not franchise and are solely owned. They have Thai food in almost every major shopping malls. Not to mention that their head-chef is also from Thailand. A rather contemporary yet rustic interior. The decor itself is indeed pretty unique. 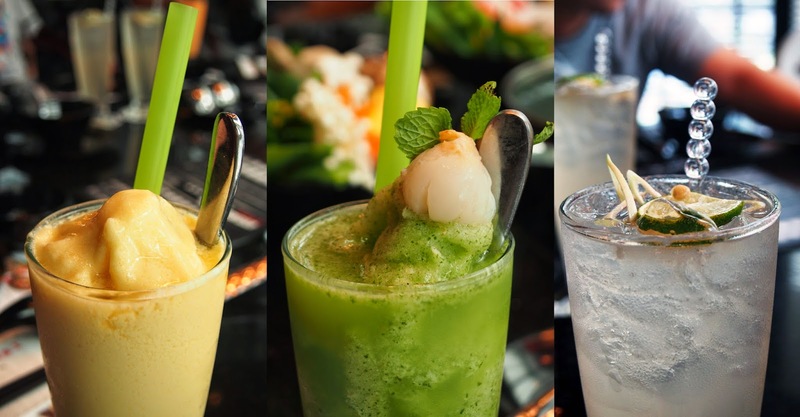 My favourite pick would be the Ice Blended Lychee Mint. Despite its weird sounding combination, the sweetness of the lychee mixes really well with mint. In fact, the mint actually helped take out some of the sweetness of the Lychee and freshen it up instead. My second pick would go to the Mango Smoothie simply because it has a blend of yogurt inside. Despite looking averagely normal, the taste was quite exceptional. The egg was moist and packed full of flavour. Furthermore, the additional fresh crab meat gave that added premium taste. It was a dish that goes really well with fragrance rice. I actually do find this rather weird, serving tempura at a Thai restaurant. However, it wasn't all that bad. A change of taste here and there was acceptable. Stir-fried Thai flat rice noodles with fresh crab, bean sprouts and egg served with ground peanuts and chilli flakes. Yeap, you heard that right. Fresh crab! A slightly more premium product compared to the usual prawns. The noodles were cooked nicely, didn't really stick to one another. Flavour was rather bland, but a good boost of chilli flakes will help uplift the flavour. Last but not least, grounded peanuts gave that added texture as well. Instead of using fish (they still use the fish plate), they've substitute it with squid. Amazingly, it works really well. Not sure is it because of the sauce they make or the fact that its actually possible, but it was delicious. The sour and spiciness of the sauce was in fact, spot on. The freshness of the squid was also noticeable. In conclusion, I really do enjoy it. The glorious looking crab with its heavenly claws served in curry sauce. Something new instead of the usual sweet & sour sauce or black pepper sauce. The crab was remarkably fresh with its meat easily peeled off. Taste wise, could've been a little stronger. I felt it was a little on the bland side. A wide range of fresh seafood served on ice which includes prawns, crab stick, squid, fish, and mussels. I actually think that the ice is a great idea as it helps to keep the seafood fresh. May not be vital but definitely a plus point. The vegetables were pretty fresh as well. Premium greens with no signs of damage whatsoever. An order of this comes with 2 types of soup; Clear Tom Yam and Original Chicken. The clear tom yam soup was surprisingly good. I mean, it wasn't all that spicy but it has that little kick. Being slightly more on the sour-side, it would definitely stir-up an appetite! I know many who love a serving of noodles whenever they have steamboat. An additional option to the seafood set! As seen at the bottom of the photo, there are several additional balls and paste. One of my favourite would be the stuff squid called Absolute Thai Paste. It is also one of their signature dishes priced at RM12.90. Of course, there will be sauces available. On the left will be the seafood sauce, the right being a suki sauce. To end our meal, I ordered their special coconut ice cream. In short, it was pretty damn good. Loved it so much that I ordered a second serving. In conclusion, I believe its fair to say that the prices in Absolute Thai Hot Pot is a little on the high side. However, all this is because of the fresh and premium ingredients prepared by them. Even the crabs are killed when ordered, not frozen. Taste-wise, everything was pretty good. The only thing I least enjoy was the tempura but everything else makes up for that. Soup was delicious, seafood was fresh, all and all, a great steamboat indeed!